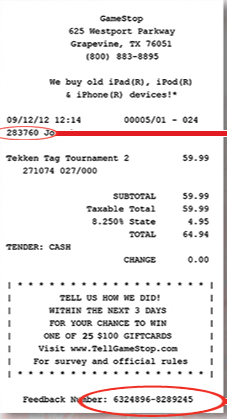 If you made a purchase at GameStop store recently, you might get a receipt inviting you to take part in the GameStop Customer Survey. Just go to the website www.Tellgamestop.com and follow the instructions to complete the survey, you could have a chance to win a $100 GameStop EGiftCard which can be used to shop at Gamestop Online Store (Gamestop.com). Please note: The sweepstakes is open to all legal residents of the 50 United States, District of Columbia and Puerto Rico, who are above the age of majority in the state or territory in which they reside at the time of entry. 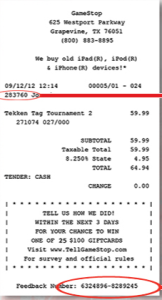 View more official rules at www.tellgamestop.com! For Canadian, visit www.TellGameStop.ca to enter the survey.